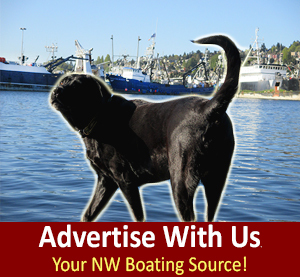 Holiday Turkey Dinner Recipe: Salty Dog Boaters & Fishermen Land & Sea Turkey Cooking, Happy Holidays! 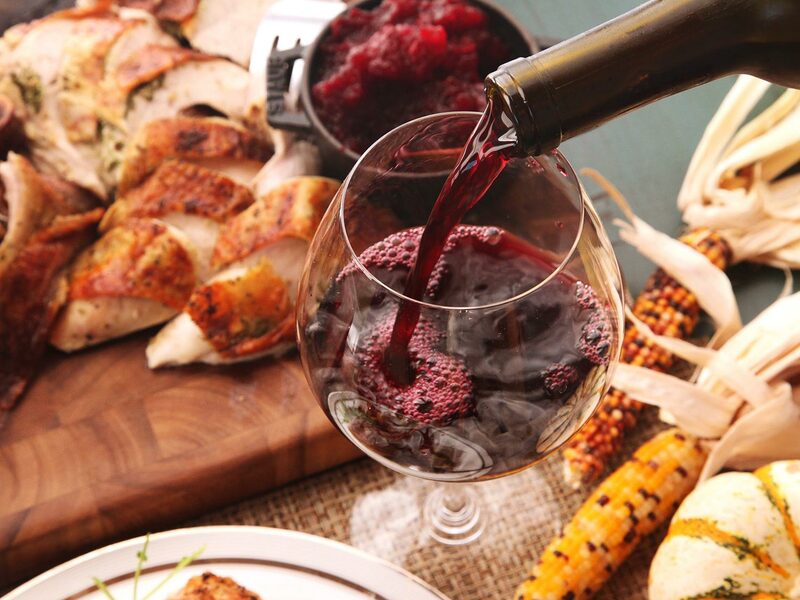 Holiday Turkey, Land or Sea Holiday PNW to AK Cooking with Family & Friends, & Lots of Wine! Holiday Turkey Dinner, turkey oven cooking in the PNW to AK, land or at sea with an oven you can cook any turkey – at sea oven size depending. Now that we just had Thanksgiving, it is a unique and rare holiday where it’s always a good idea to have dinner conversation stay far away from politics and religion and in some families bringing up the ‘right to bear arms’ is one way to raise blood pressures at the dinner table. Since Trump just won over Clinton it’s especially a good idea not to bring up this epic presidential campaign. Some of us this holiday season are very happy about the ‘T – Man’ winning but since nearly 1/2 of our current Thanksgiving table guests were on the ‘chick team’ we will respectfully keep our policy and political lips shut this turkey day! God Bless America, we are thankful for all our men & women in service keeping up us safe! May you have a blessed and healthy holiday season! Not everyone knows the step by step basics of cooking a turkey, so here we go, hold on for the ride! Start with make sure your Turkey is defrosted (an honest mistake I did in my college days – didn’t know you take the bird out in time to get her defrosted – thankfully my Nana saved the day that Thanksgiving!) – NEXT: Remove the turkey from the brine and rinse it under cold water. Then, fill the sink with cold water and soak the turkey for 15 to 20 minutes. This will remove any excess saltines on/under the skin and just leave you with wonderfully brined, tender turkey. Next, place the turkey in the rack inside the pan – or our family trick is: make tinfoil – 3 pull strips to pull and lift the turkey into the pan and out of the pan hours later – bake your turkey on its lowest level and preheat the oven to 275°F. 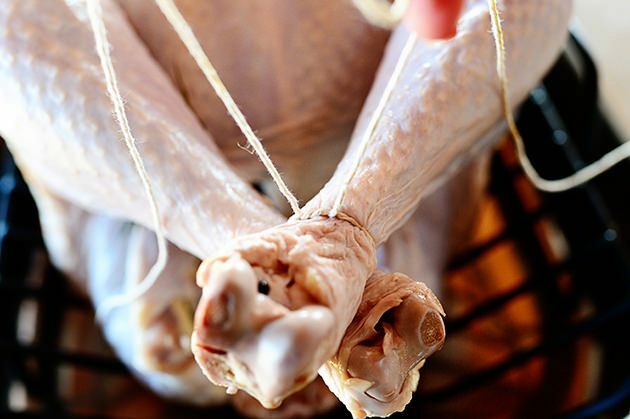 Make sure you put in ‘cheesecloth’ to stuff your bird, the cheesecloth makes taking the stuffing out clean, simple and easy. Thanksgiving Dinner, After you stuff your turkey tie her legs, Turkey prep time! Next up: Place the turkey breast-side up in a roasting pan with a rack, tucking the wings underneath the body. Cross the legs and tie them with kitchen string to secure them. 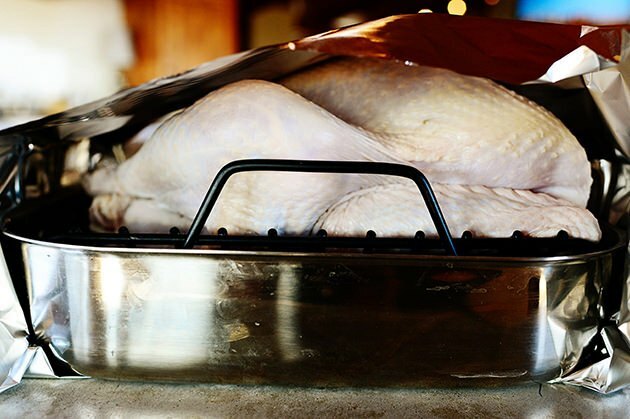 Cover the turkey completely with a large pan lid if you have a large oven or tin foil will work also. 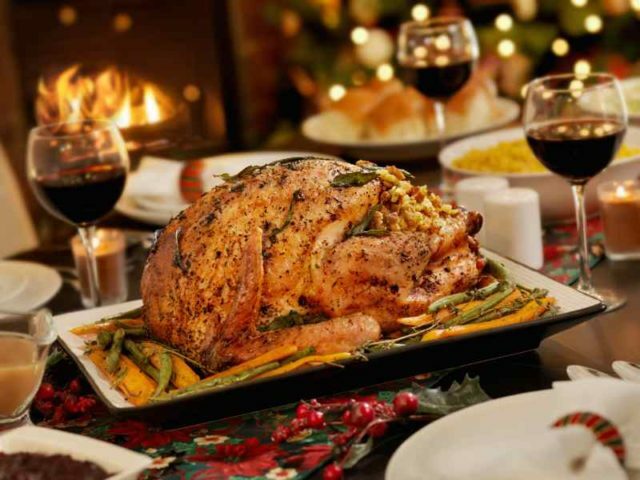 Basting your turkey: – this is depending on family tradition and how much work you want to do and how moist you want your bird. I like to bast my bird every 30 to 45 min. 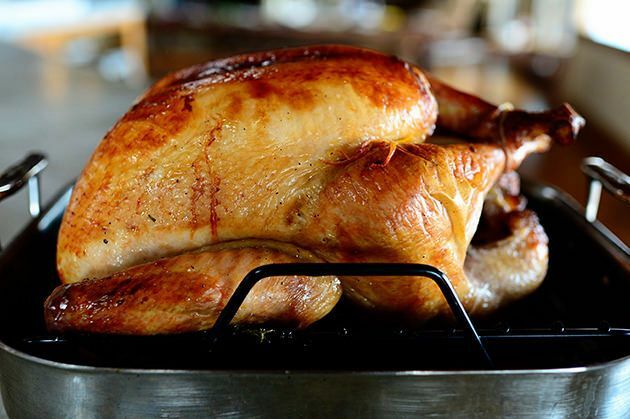 Yes, all day you will not go more than 50 ft. from your turkey bird, as you will feel married to it… your dinner guests with love and thank you later to your basting hard work and commitment! Foil Removal Time: After the turkey has roasted for the first stage, remove the foil and smear the butter mixture all over the skin of the turkey. Note that because the turkey has been covered, it will still be very pale. That’s totally normal! It’s getting ready to get gorgeous here in a bit. Butter: Get the butter mixture in all the crevices! Tickle it a little! Then insert a meat thermometer into the thigh of the turkey, raise the oven temperature to 350°F and put the turkey back into the oven, uncovered, basting it with the juices/butter in the bottom of the pan every 30 minutes. 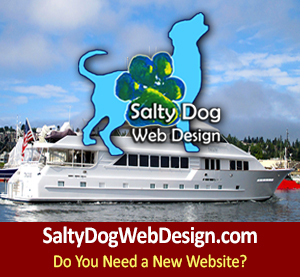 Thanksgiving Turkey, PNW Galley Cooking at Sea, Fresh out the oven! Roasting: Roast the turkey until the temperature registers 165°F. For a 20 pound turkey, this should take an extra 1 ½ to 2 hours. Keep basting it every 30 minutes during this stage so that the skin will turn a deep golden brown. REMEMBER: the turkey needs another 20 minutes or so to get totally done. Remove the turkey from the oven, cover it with foil, and let it rest for about 20 minutes before serving. Serve the turkey on a big, lovely platter with branches you found and greenery to accent your turkey! 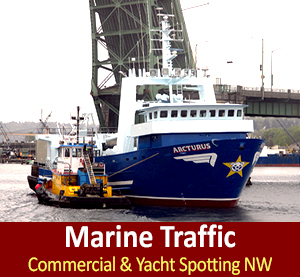 Happy Thanksgiving, PNW to AK Boaters & Fishermen, Galley At Sea Turkey Cooking & Lots of Wine! ENJOY! 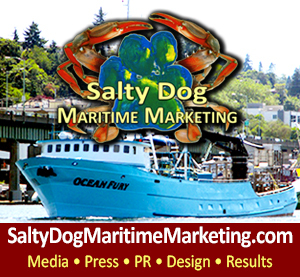 Happy Holidays To All Our Salty Dog Boaters, Fishermen & Their Families!